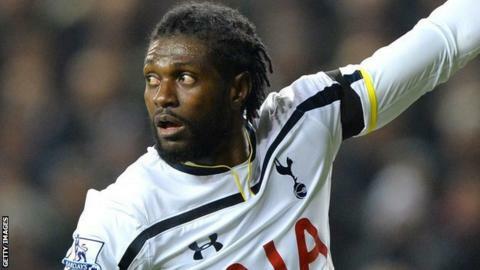 Togo coach Tom Saintfiet is hopeful striker Emmanuel Adebayor will discuss making a return to the national team. Adebayor, who has been released by Tottenham, missed an Africa Cup of Nations qualifier in September after a row over him losing the captaincy. He is believed to be back in Togo but Saintfiet "has not spoken him yet". "I am here and if he is ready for a chat he is always welcome. Let's hope he feels the need to help us as a team," Saintfiet told BBC Sport. In June Saintfiet removed Adebayor from his squad for failing to arrive in time to prepare for a friendly against Ghana. Although the 31-year-old returned for the Nations Cup qualifier against Liberia a few days later - which they won 2-1 - he did not skipper the side. Adebayor then failed to respond to a call-up for September's qualifier against Djibouti, which Togo won 2-0, and his international future remains unclear. However, Saintfiet has made it clear he would like the forward to be part of the team as they try to qualify for the 2017 Nations Cup in Gabon. "Everyone who has a Togolese passport, who wants us to qualify and to win and who will follow the rules of the federation, is welcome to play for the national team," Saintfiet said. "Emmanuel is the best striker in the history of Togolese football and one of the best African strikers in history. To replace him with the same quality, maybe we cannot do that at this moment. But also our opponents do not have someone like him." Saintfiet also revealed he is working to bring in new players to try to fill the gap, should Adebayor not return. He added: "If it doesn't work out (with Adebayor) we have other players we are talking with like Peniel Mlapa, who is a a Germany-based Togolese striker, and another player for the future is Gilles Sunu, who played at Arsenal and is now playing for Angers. "There are a few players on the list and we have other players who play in Africa and in Europe who can help us." With a 100% record so far, Togo are top of Nations Cup qualifying Group A on six points - three clear of Liberia - and in a strong position but Saintfiet remains wary that things could easily change. "We are at the moment in the best position and the pressure is on Tunisia but we must not underestimate Liberia who have to play Djibouti twice and could also reach nine points after those two matches," he said. "But I am convinced that we have the quality to qualify and until now the group of players has confirmed that."